An unfortunate incident in the nation's capital when the false religious elements misused the teachings of Islam and took up arms against the nation. 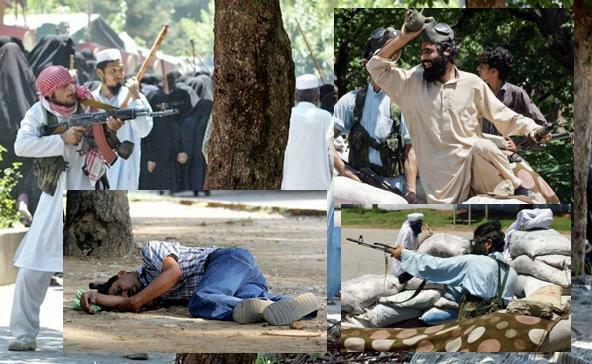 The hostile youth of Lal Masjid and Jamia Hafsa started their campaign to enforce Islam by making aggression and threatning suicide attacks on the government imposing direct threat to the civilians and ultimately vowing to launch Jihad against the country. The fact is that these extremists are referred as Kharijis and Takfiris who are quick to declare war on Muslims if they disagree with them, they consider all Muslims as kafirs/apostates/spies/enemies who are not with them and consider it legal to harm their lives, wealth and property. The psychology of these people is that they think all the Muslim states are not following Islam therefore it is legal to first declare Jihad on them. 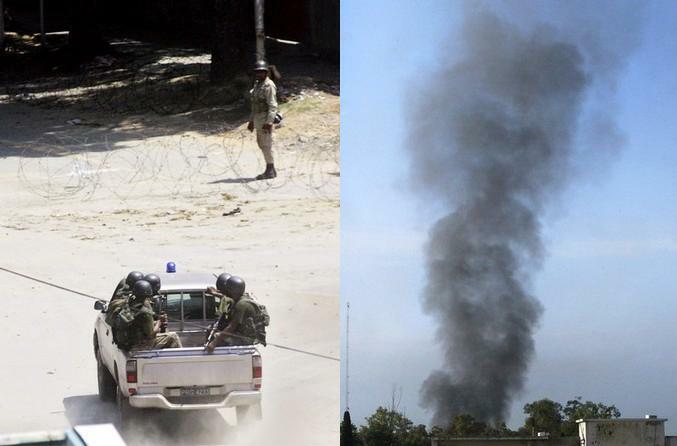 After several months of hostility, clashes suddenly erupted between the militants and security forces which later turned deadly when one Rangers personnel was shot dead. 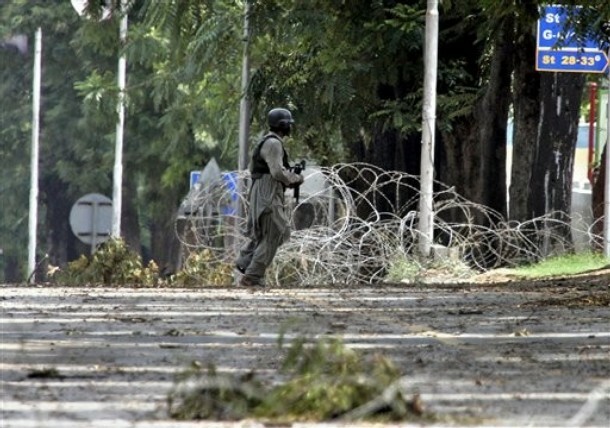 The battle started when the militants opened fire at the Rangers during negotiations at the main entrance of the mosque after a protest demonstration by the female students of the seminary at about 12:15 pm. 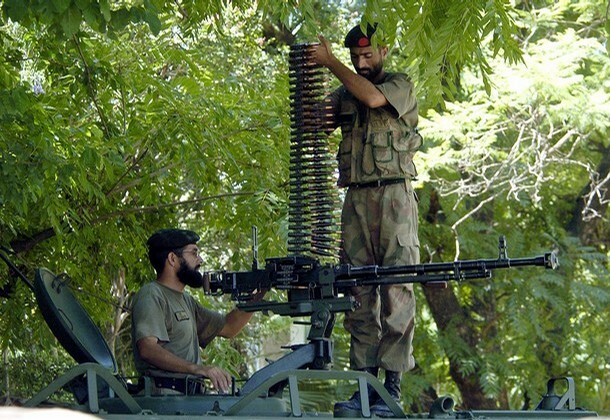 In the firing, Lance Naik Mubarik Hussain and Lance Naik Ghulam Abbas of the Rangers sustained multiple bullet injuries and were shifted to Federal Government Services Hospital (FGSH). Mubarik died during surgery while Abbas was in critical condition. Mubarik was driver of Col Mashallah, who was negotiating with the Lal Masjid administration to get back a gun and a wireless set earlier snatched by the Mosque militants from a Rangers personnel. 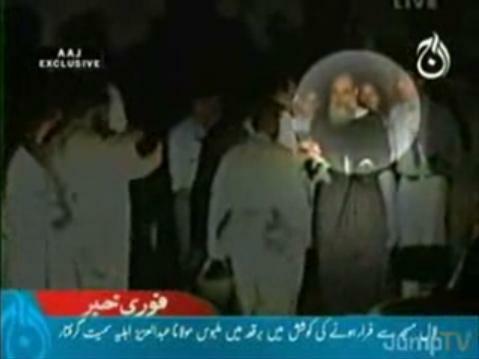 Mubarik was standing beside the colonel when the students opened fire. 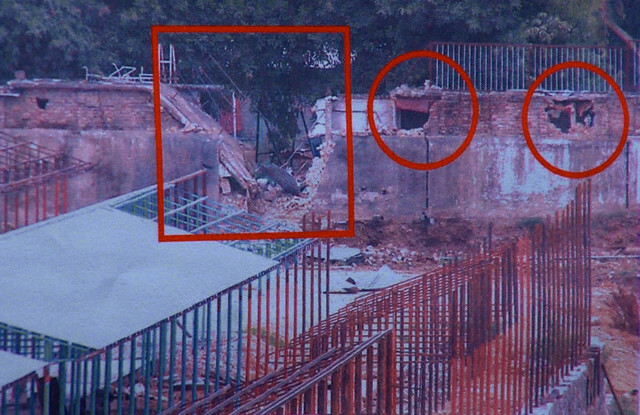 The students of the seminary went on a rampage and the Lal Masjid administration declared �Jihad� on behalf of Maulana Abdul Aziz, Khateeb and administrator of the mosque. 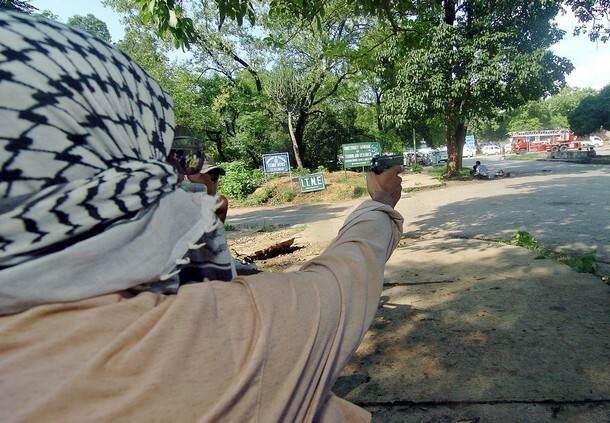 The spokesman of Lal Masjid told that their suicide bombers had been granted permission to find targets on their own and strike wherever they choose to. 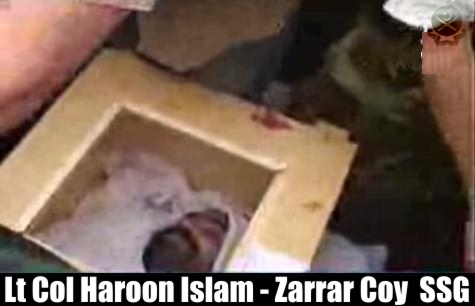 The Namaz e Janaza of Lieutenant Colonel Haroon Islam was held at Chaklala on Sunday morning. He was later buried in his native city of Lahore. Soldiers hold their positions as the siege continues. 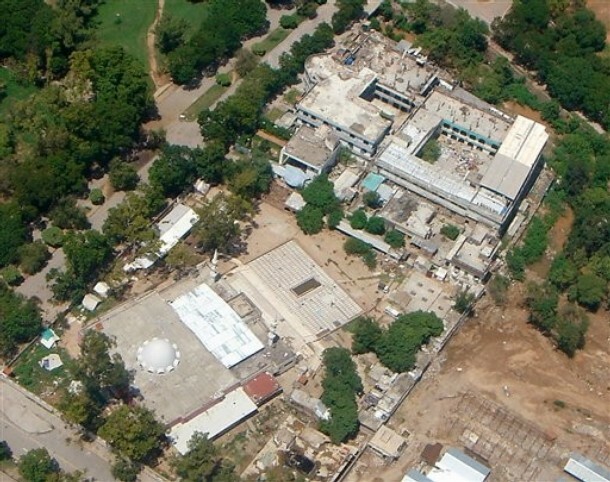 The following night, UAV flew over the complex capturing images of the movements inside to plan starategy for the inevitable assault and to also study the claims of the cleric Abdul Rashid Ghazi regarding casualties and damage caused to Lal Masjid and Jamia Hafsa. 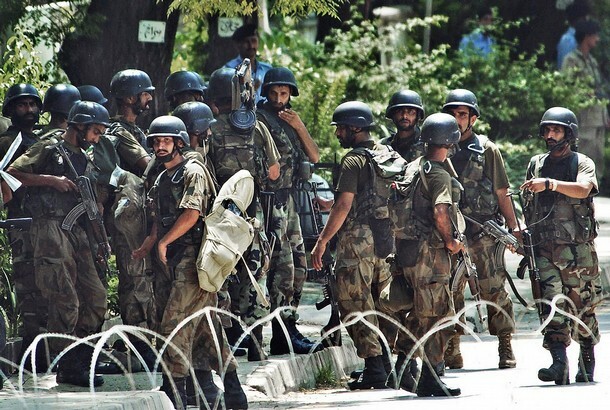 SSG commandos from Zarrar Company move towards the mosque for a strike against the Takfiri militants. 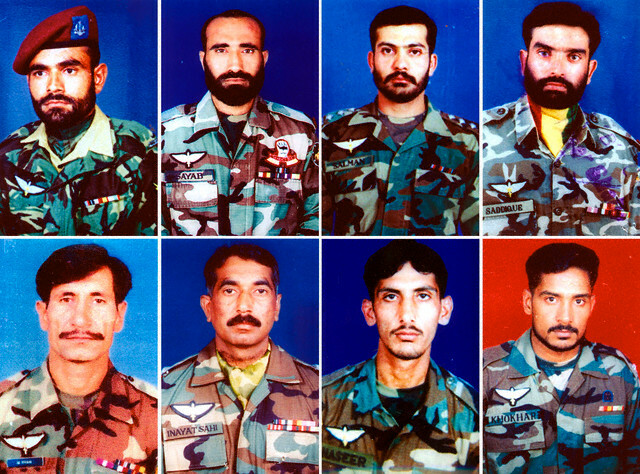 Captain Salman Farooq Lodhi is also seen at the front left. 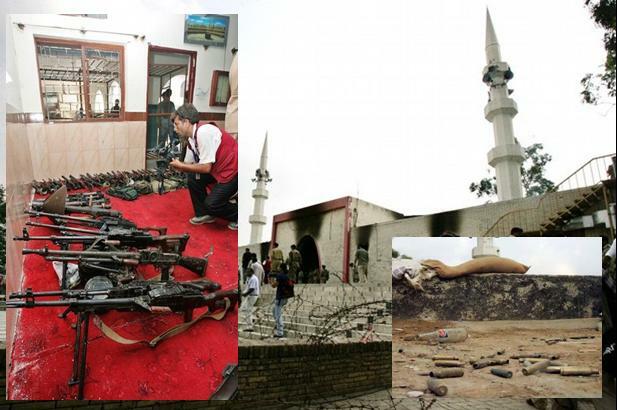 The commandos launched the attack by breaching the mosque from the south and assaulting it in three directions, heavy fighting started between both sides, some 20 children rushed towards the advancing troops and were brought to safety. Reinforcement commandos move towards the complex as intense battle continue throughout the day between the die hard Takfiri militants. The assault combat was aimed at ending the retaliation by extremist militants and saving the lives of hostages who were trapped inside the mosque. 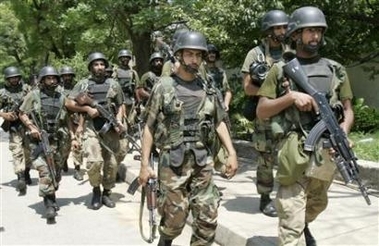 After the militants were neutralized in the mosque the commandos progressed deeper into the complex, the seminary was booby trapped to stop the advance of the commandos and it took several hours of intense fighting to take control. 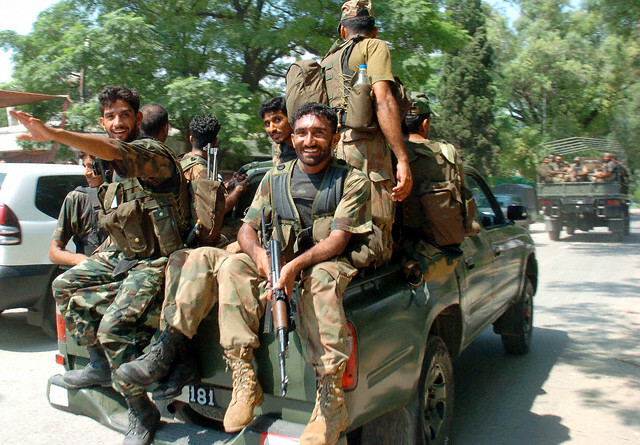 The bitter battle continues and casualties are inflicted, injured army commandos are brought to a hospital. 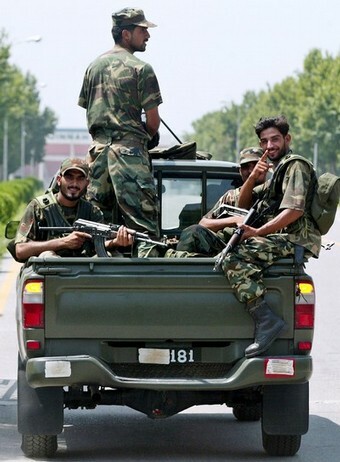 Pakistani troops make way to ambulances toward the besieged compound. 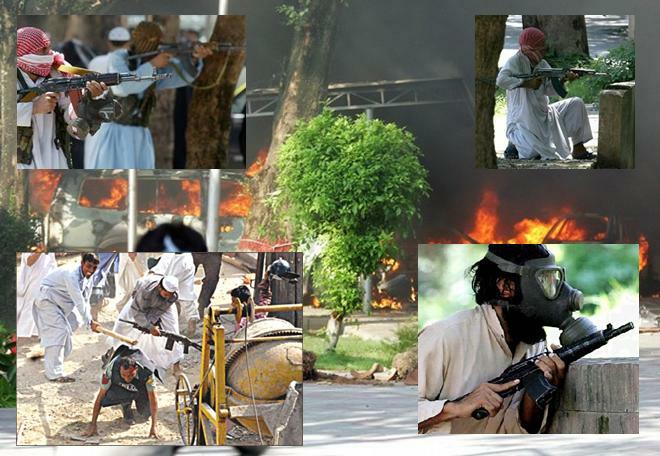 100 injured militants and students from the besieged mosque were brought to various hospitals in Islamabad. 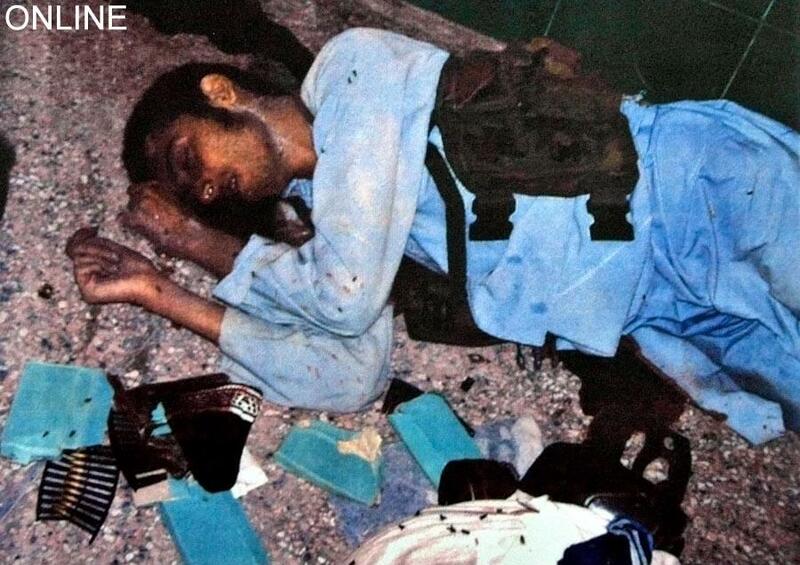 Some secured pictures by ONLINE establish the presence of foreign militants, photo shows a dead body of foreign Uzbek militant lying at the compound. Secured pictures by ONLINE establish the presence of foreign militants, some dead bodies of foreign militants lying at the compound. 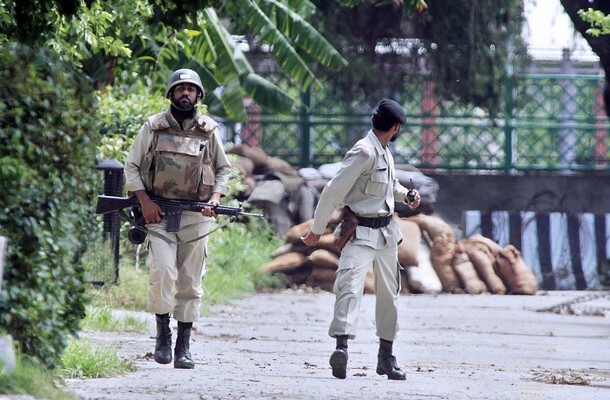 SSG commandos leave the area after wiping out the militants from the compound, troops cleared the final clutch of diehard militants following two days of intense fighting that left at least 80 dead. As the role of �free� media was concerned, it was criticizing the government before the assault lecturing that the government was continuously delaying the prolonged operation to gain political mileage from the crisis while the residents of the affected sector pressed on the government to wind up the operation as soon as possible. When the operation concluded the same media which earlier criticized started blaming the government for taking action raising cries that brutality had been committed. On the same hand the supporters and former students of the seminary did their best to emotionally trap the nation and grab sympathies by presenting the operation as a massacre against them, however they were not very successful. 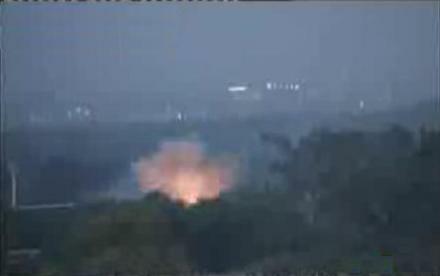 When the operation concluded, the free media in a usual habit to make a hot issue spread a rumor that White Phosphorus, a chemical weapon was used by the commandos in an order to give an impression to the nation that the commandos were brutal and tyrant and they only went in to kill women and children instead of battling the militants. 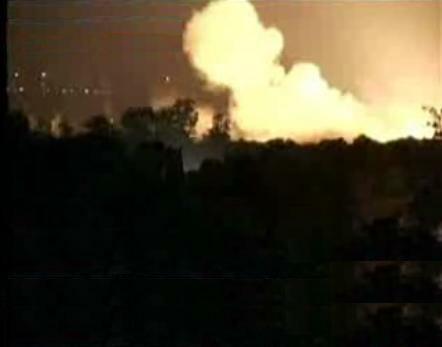 The fact about White Phosphorus is that the army uses a grenade called SMOKE DISCHARGE/GRENADE WP P3 MK1, locally produced in POF and is used for smoke screening purposes in battles which is an ordinary grenade and not a chemical weapon. The name was misused in the media. The media played with the casualty figures and spread another rumor that 1000 were killed in the battle by the commandos and more than one bodies were put in one coffin. Those who had put up these claims could never themselves prove them to be true. Apart from these false doubts which fall in the category of lies, a fact which everyone saw was that the number of parents who were looking for their lost ones had fall less than 80 and continued to decrease. 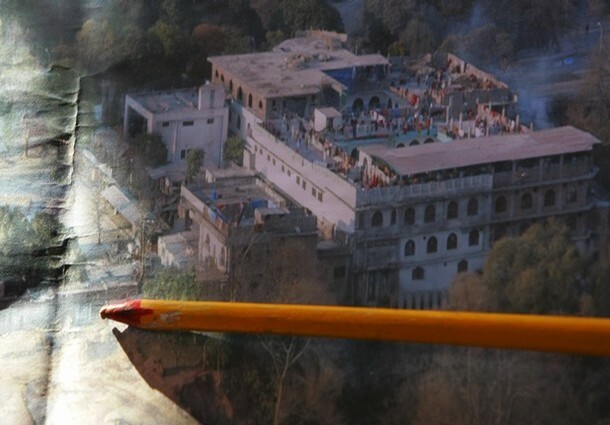 Another fact was that the attendance register of the seminary showed a presence of around 1700 students including those who did not reside in the complex. More than 1000 had come out of the seminary in the initial days the operation started and many continued to escape the following days except for those who were not being allowed to leave by the militants. Concludingly, this is not the first incident of its kind, history tells that many times unislamic acts have been done taking the name of Islam. In November 1979 during Hajj, a similar and more shocking incident was witnessed when so-called Islamic militants seized the Holy Kaaba, the armed takeover resulted in bloodshed in the most holiest site of the Islamic world. 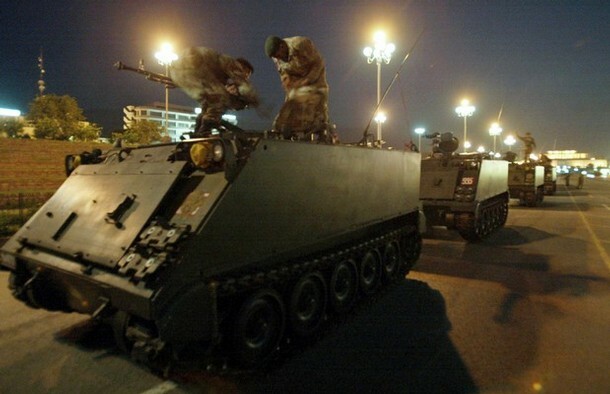 The siege continued for two weeks with a final battle to regain control of Holy Kaaba.